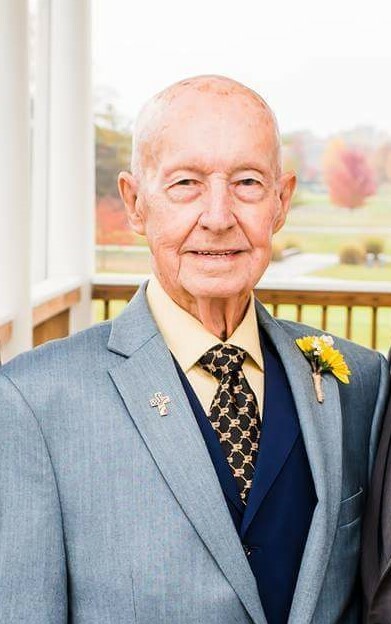 Fred C. Sisk, 95 of Indianapolis, passed away February 9, 2019. Born January 21, 1924 in Cynthiana, Indiana, he was the son of Carl and Etna (Smith) Sisk. Fred was an U. S. Army veteran and attended the Bethel United Methodist Church. He worked for the U. S. D. A. Soil Conservation Service for 30 years, retiring in 1982. He was a member of the Pike Township Lions Club. Survivors include his loving wife of 42 years, Elizabeth (Betsy) Dison Sisk of Indianapolis; son, Doug Sisk (Wendy) of Danville; grandchildren, Chad Sisk (Kari) and their children, Drew and Kerrigan of Anderson; Samantha Bock (David) of Fishers; stepchildren, William R. Dison (Jeanne) of Zionsville, Ronald L. Dison (Linda), and Nancy Dison; his step grandchildren, Jonathan C. Dison (Cherish) and their children, Emily, Sarah and Anna, Jeffrey Dison, Nathan Dison (Heather Hardwick) and their children Charlotte and Thomas of Oakland, CA and Heather Dison and her daughter, Danielle Urig of Tampa, FL, Nicole Hermann of Chicago, IL. He is predeceased by his parents, brother, two sisters and his stepson, Dr. Dwight L. Dison. Family and friends may call from 4:00-7:00 pm on Thursday, February 14, 2019 in Baker Funeral Home, Danville. Interment will be in Mill Creek Cemetery. A Memorial Service in Fred's honor will be held at Bethel United Methodist Church on Sunday, February 24, 2019 at 2:00 pm. Bethel is located at 5252 W 52nd St Indianapolis, IN 46254. In lieu of flowers, contributions to support the Indy Honor Flight may be made to Rotary International Danville Club c/o Baker Funeral Home 387 E Broadway St Danville, IN 46122.